Fifteen coastal dune lakes, which are globally rare, formed along the Walton County coast in the northwest region of the state. 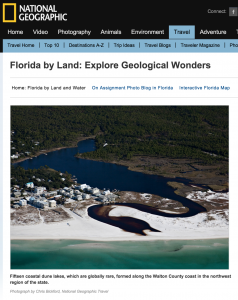 To see how Florida was formed—and continues to be shaped—by forces of water and wind, visit caverns, sinkholes, and other often rare and unexpected wild spaces. Whether underground or hiding in plain sight, these natural ecological treasures provide opportunities for exploration and a living link to the past.